This Vegetable Fried Brown Rice comes together quick with just 5 ingredients. A tasty and healthy brown rice recipe perfect for meatless Mondays or a side dish on busy school nights. If there is one thing I’m learning it’s that I will always thank myself on Tuesday night for cooking up a batch of brown rice Sunday. Food prep like cooking grains, baked potatoes and even shredded chicken in the slow cooker ALWAYS saves me during the school week. When I find myself unsure of what I want to make for dinner (not to mention, short on time), it’s always incredibly helpful to have a few staples already cooked up and waiting in the fridge. Brown rice is one of those staples and helps to make this super quick and easy Vegetable Fried Brown Rice possible even on the busiest of nights. What veggies go in fried rice? 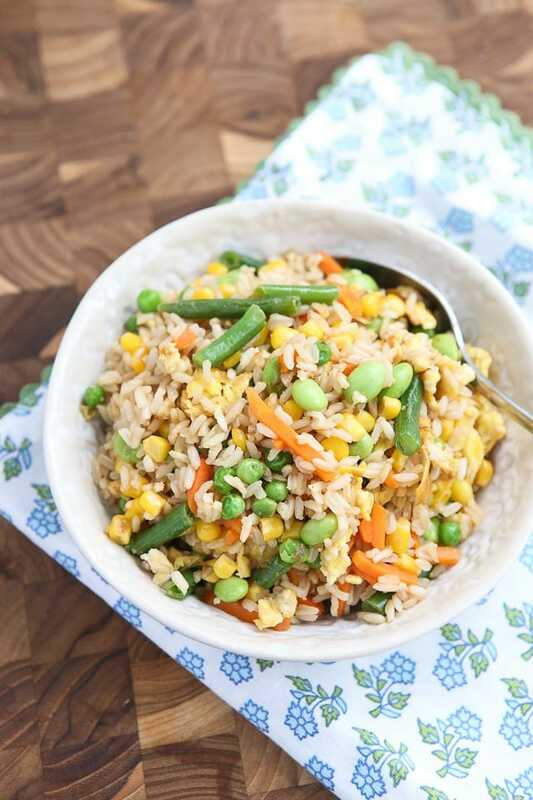 I found a frozen organic vegetable medley with edamame at Costco and love it for easy side dishes that I know my kids will eat, or to include in healthy brown rice recipes like this one. 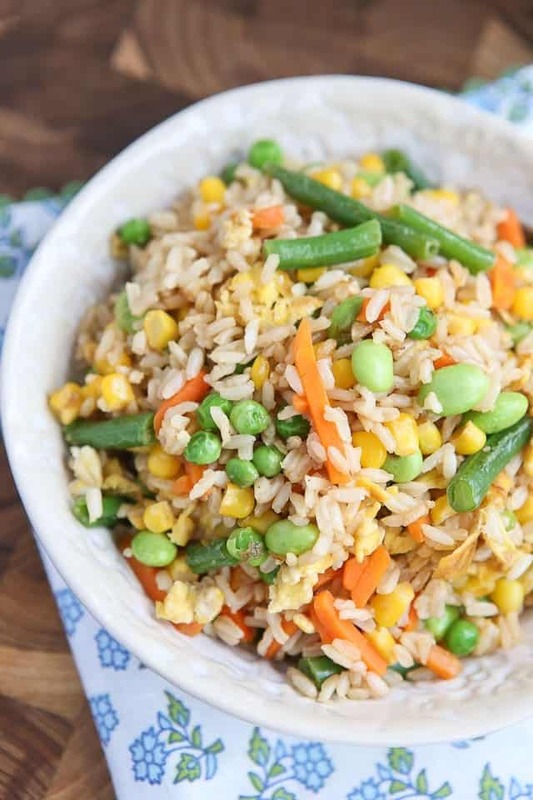 Frozen mixed veggies are a great shortcut ingredient for fried rice but you can include so many different veggies, especially if you are trying to clear out the produce drawer. You can make this fried brown rice recipe even better by throwing in any leftover protein you may have (steak, chicken, shrimp) to bulk it up or if you are in the mood for something light it’s great as is. My family loves Asian food and I try to make a stir fry at least once a week. This veggie fried rice is the perfect addition to stir fry night. This 5-Ingredient Vegetable Fried Brown Rice was featured in Vegetarian Recipes with Five or Fewer Ingredients on Greatist! Heat oil in a large wok over medium high heat. Add frozen mixed vegetables and cook for 2 minutes, stirring frequently. Add brown rice and soy sauce to vegetables and cook for up to 5 minutes or until all is heated through. Should I Eat Breakfast Before I Workout?